What a mouthful, this name, eh? But don't let it discourage you, stay with me on this one as it's an interesting product. You probably know that any skin can be dehydrated, even oily ones, because dehydrated skin lacks water, not oil. My skin tends to be more dehydrated as the years go by. In Winter, it's normal to dry at the same time, then in the Summer it is more combination with a slightly oily T-zone and cheeks that stay a bit dry, definitely a bit dehydrated as well and overall dull. Givenchy is, once more, and under-hyped brand. Not only does their makeup not get the credit it deserves, but you hardly if ever hear about their skincare - even though they have a range targeted for all kinds of dehydrated skins. Which I don't think is the case for any other luxury brand. The Hydra Sparkle range is consequently about giving back some glow to your dehydrated skin while being suited for your skin type. With the Summer being back (officially, in the facts not so much but that's another story) I wanted something that would control the oils as well as give moisture and luminosity back to my cheeks, and that is exactly what this Mat Luminescence Moisturizing Fluid does. The packaging is very pretty and sleek, with the blue color evoking water. It's all made of plastic so is light and not breakable - but can feel a little cheap if you like to have a solid glass packaging for this kind of price. This particular product comes with a pump, which is very hygienic, and one pump is perfect for your whole face so you won't waste product; it's also quite easy to control how much you dispense. The fluid itself is white, has a light fresh, slightly sweet scent that is not overwhelming at all and that disappears quite fast. Once applied, the product sets really fast and makes your skin smooth, so it's a perfect base for makeup. The result is really luminescent. The one thing that bothers me a bit here, is that it will make your T-zone equally as luminous, even though on the touch it will feel matte and not oily at all. So I personally wouldn't wear this on its own, I would at least powder my T-zone so it doesn't look shiny. But of course on my cheeks I love the effect. It does compare with the result you would get from Mac Strobe cream, but with a lighter texture, or the Oskia Get Up and Glow serum I used to use, but then the glow would still be present after makeup application, which wasn't the case with the serum. All in all I would recommend this product, and I would advise you check the range if your skin is dehydrated. It is a bit pricy though - this fluid is 50ml and £38 - €54 - couldn't find a US price. 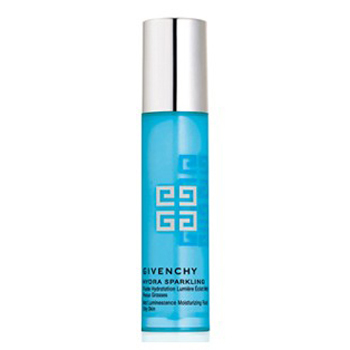 Have you tried Givenchy skincare? Hi there!!! I have tried this and had a good experience with it... there is also a lip balm that's fabulous, and gives you a slight rose tint. I just love that one. I totally agree with you that Givenchy is an under-hyped brand with many good products.